Kalahatti Waterfalls Ooty are one of those places, where you feel that God is an architect. With the majestic back drop of the Ghats the waterfalls are a sight to see. 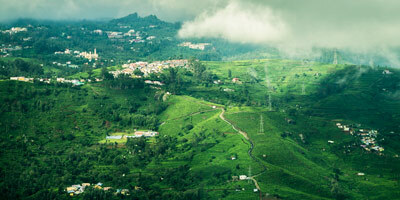 Located at about 15 kilometers from Ooty, the waterfalls can be reached after a two mile trek from the Kalahatti village. It is fabled that Saint Agastya used to live in these parts during his time. You find a wide variety of flora and fauna surrounding the waterfalls. This makes the place an ideal setting for bird watching. The more adventurous ones can venture deeper into the forest and try to explore the unknown. But please don't go exploring too much as these are the water grounds for many wild species including the black panther and wild dogs, that are much healthier and also stronger than an average human. If you are lucky enough you might spot a herd of wild buffalos and the reclusive Sambhar deer coming for a quick drink near the falls. As is the case with any other waterfalls, it is not advisable to visit the falls when the monsoon is at its peak. The flow of water within the mountains is very unpredictable and it can catch you off guard with the sudden surge in water level. The best time to visit the falls will be during the months of September and November, when the monsoon is drying up and the winter is beginning to set in. be sure to take warm clothes with you.